﻿ Kremlin, north part. 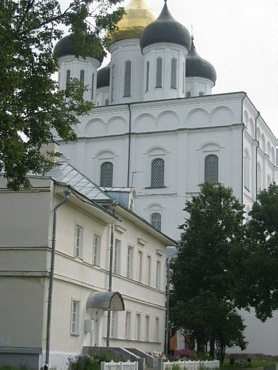 Pskov is the center of Pskov region. Location, past, present. I live in Russian Pskov city in north-west of Russia. I would like to share with you this numerous ny pictures. For this photo gallery I selected the best pictures that reflect the quiet and solemn beauty of the Pskov area, its historical and cultural heritage and the spirit of its inhabitants. 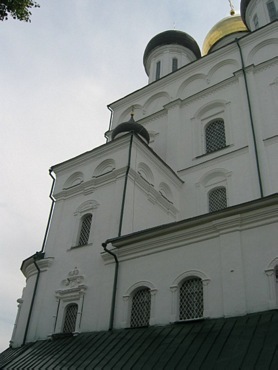 <1> Photos of ALL Old Churches in Pskov city. Photos of Old Churches in Pskov city. <2> My photo gallery, of ancient Towers in Russian Pskov city. Here are was 40 towers in Pskov city, in ancient times. <3> Pskov Modern buildings, photo gallery. <4> Photos of Old Izborsk, Old Fortress is located 32 kilometers west of Pskov. Photos of Swans. The picturesque nature, plenty of forests, rivers, lakes create the perfect conditions for rest. 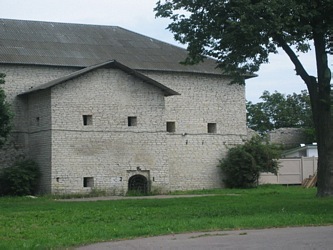 Old Fortress. Game reserve. <5> Photos of Russian airplane IL-76. Jubilee of Russian regiments of the 76th Pskov Airborne Division. <6> Photos of Military Performance on the Velikaya river. Photos of the tanks. Crossing Velikaya river. Reenactment of the Battle of the Liberation of Pskov (23 July 1944). Photos of Military Performance on the Velikaya river. Photos was taken 23 July 2004). in the showroom of the Administrative Chamber in Kremlin. <8> Photo gallery of Pskovian Ancient Chapels. <9> Ancient Russian city Pskov has celebrated Jubilee 1100 year, 20 - 24 July 2003 year. 24 July, 2003 was St. Olga's Day with Holy Liturgy in the Trinity Cathedral. Religious processions from the Orthodox churches to the Veche square. Festive service on Veche square of the Kremlin. Here you could to see a lot of new photos of Great events. <9> Masters town opening. Jubilee of city. 1100 anniversary. All things was hand made. <10> Population in Russian Pskov city is 200 000 people. Pskov, although a small city, has a rich cultural heritage, which is evident from the vast number of ancient monuments, civilian houses, merchant chambers and forts around Pskov. <11> My photo gallery, of ancient Towers in Russian Pskov city. Here are was 40 towers in Pskov city, in ancient times. Photos of ancient Towers. Put your mouse over the photo and look at the description of the photo appears over this photo!